Hidden Tracks: Was this the trap which caught the Franklin Expedition? Was this the trap which caught the Franklin Expedition? In an earlier post I made the suggestion, which I have not seen proposed elsewhere, that the conventional interpretation of the Victory Point note may be wrong. I pointed to the ambiguities in its wording. The conventional interpretation is that in it Fitzjames says that the Franklin Expedition made their voyage NORTH from Beechey Island to 77 degrees north in the summer of 1845. 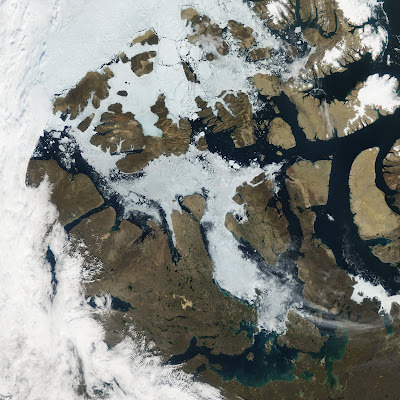 They then wintered at Beechey Island before making a second attempt on the North West Passage to the SOUTH down Peel Strait before becoming beset to the north of King William Island in 1846. I suggested that an equally plausible interpretation of the Victory Point note would be that their voyage in 1845 was only as far as Beechey Island and that their two attempts through the Passage, first NORTH and then SOUTH, both took place in 1846. Unfortunately the Victory Point note really is ambiguous on this and until new evidence emerges there really is no way to be sure one way or another. The more I think about it, the more my personal suspicion is that the conventional interpretation is wrong and that both voyages DID take place in the summer of 1846. It is a NASA image created by Jesse Allen, using data provided courtesy of the MODIS Rapid Response team. It shows an ice pattern EXACTLY as you would expect if the alternative interpretation is correct. You can see that from Beechey Island the channels north either side of Cornwallis Island are open and would just about permit the ships to sail as far as 77 degrees north and then return by the west side of Cornwallis Island. Just as described in the Victory Point note. From that position there it would have been comparatively easy for the Franklin Expedition to have found the open entrance to Peel Straight. Notice also that the ice there becomes heavy north of King William Island, more or less where the Expedition DID become beset. This image was taken on 27 August, 2009. Was this exactly how the ice looked in August 1846? It's not entirely implausible that the Franklin expedition both circumnavigated Cornwallis and sailed down Peel Sound in one season. The comparatively late date -- "3d September 1846" -- reported on the datepost at Beechey by Adam Beck would make more sense if it were left there by a party passing by Beechey on its way further south (having exhausted the northern option) than if it were left at first departure; it would be highly unusual in any season for the ice not to break up until September. However, the lovely NASA image is of uncertain value -- ice conditions are so very changeable that we'd need more precise data on the weather condition in 1846 to have any idea what the ice patterns were likely to be; indeed, we'd need data for all the early 1840's to know how much multi-year ice was likely to be about. The late Roy Koerner's study suggests this was an unusually cold period overall, but his ice cores had a sampling error of +/- 5 years, so couldn't establish year to year conditions. Roy told me, though, that it's possible that a core could be obtained which would have a smaller margin of error and yield more detailed results. So far as I know, though, this had not been done. Well you are right, Russell. It's mainly just a great photo, but it does illustrate that conditions could favour a North / South voyage in a single season. It also illustrates how naive they were to think that there was a navigable passage or an open polar sea. Look at all that ice! Speaking about sea routes, has there been any word regarding the ProCom search expedition? Their website has been essentially dormant with no updates, but I thought they were planning to set out in July and would have been back by now. The image is indeed very suggestive. Even if a long time has passed, we can be pretty sure that in those days the situation was either the same or worse. The photograph shows that the alternative proposed is not impossible in one season. In view of this, and comparison with the list of officers of the Terror, it seems more plausible that, after Sir Franklin died, both Fitzjames and Gore jumped to the position they were supposed to occupy, had Franklin not been. This is moreover plausible, since the signature of the record reads “James Fitzjames, Captain HMS Erebus”. I agree with you. The more I think about it, the more likely it is that this is what happened. We know the Expedition wintered at Beechey Island 1845-6 from the grave inscriptions and I think it is safe to assume they spent as much time as they could there carrying out magnetic observations and exploring the surrounding area and seaways. 1) To carry out such a long voyage in 1845 would require a very high average speed through ice-choked waters. 2) If the ships were returning to Beechey Island after this northerly attempt to overwinter during 1845-6, there was no reason for them to do so via the west side of Cornwallis Island. In fact this would be a big risk. Whereas returning south by the west side of Cornwallis Island makes complete sense if their intention was to sail from there south via Peel Strait. 3) The only real reason to assume the northabout voyage took place in 1845 is the Victory Point note. Yet having had the huge privilege of spending many hours reading Fitzjames' writing I think the note is ambiguous. So my thinking is simply that this whole issue is ambiguous. I certainly think it is very dangerous to base an assumption on an assumed mental disability on the part of the officers. That is to base a hypothesis on a hypothesis. The promotions issue is slightly different. All the officers knew they would be promoted over time, simply with the passing of the years, and this continued until they were declared dead by the Admiralty. That's how Franklin became a Rear-Admiral, until the Victory Point note proved that in reality he had already been dead before his promotion-by-rote to Rear-Admiral. Fitzjames was in a different position. Before he sailed he had specifically been promised promotion to Captain and the only issue was whether this would be effective 30th June 1845 or 31st December 1845. In fact it was 31st December, although he was never to know. But I don't believe he used the rank as he had no confirmation of it. Instead, while Franklin was alive but perhaps disabled he described himself as 'commanding HMS Erebus' which would have been correct, and then as Captain after Franklin had died. I interpret his description of Gore as 'the late Commander Gore' as meaning that when Fitzjames officially took the position of captain of HMS Erebus after Franklin's death, Gore took Fitzjames' position of 'Commander' through a 'field promotion'. The saddest aspect of this is that Franklin's orders specified that if he died, Crozier was to take Franklin's position as Commander of the Expedition and Captain of its flagship, HMS Erebus, but by that time they were all so far from the outside world and perhaps iin such despair that he chose instead to remain captain of the Terror and Fitzjames took the captaincy of the Erebus. Both officers were presumably so entrenched with their ships' companies, and Crozier had spent so many years by then on the Terror, that they ignored these orders. In my last post when I commented "while Franklin was alive but perhaps disabled he described himself as 'commanding HMS Erebus" I didn't make myself very clear. The point I had in mind was this. The Victory Point note was one of three of the record sheets the Expedition was supposed to deposit as they progressed, either in cairns ashore or in sealed metal cylinders when afloat. Three of these (only) have been found. One was the Victory Point note. Another was deposited by Gore on the same expedition on which he deposited the Victory Point note and gives the same information. A third was thrown into the sea on (I think) 30th June 1845 off Greenland. What I had in mind with my 'commanding HMS Erebus' comment was that Franklin was described differently on the first note. On the 30th June 1845 note he is described as 'Captain, HMS Erebus', whereas on the two later notes he is described as 'Sir John Franklin commanding'. This suggests to me that by the time the two second notes were written he was no longer effectively Captain of HMS Erebus, perhaps as he was in the final stage of whatever affliction killed him. Therefore when he died it seemd natural that Fitzjames should take over as 'Captain, HMS Erebus' and Gore as 'Commander', as de facto they had perhaps had thse positions for some time. William, I think it's making much too much of the difference in Franklin's appellation (Captain vs. "Commanding") -- both were accurate, and neither suggests any loss of capacity.